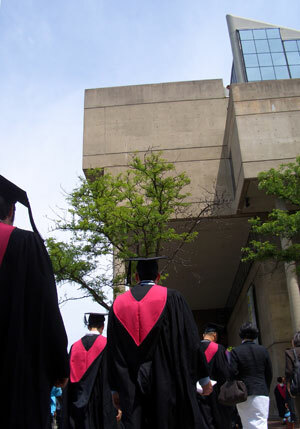 Whether they pursue a bachelor’s or master’s degree, many architecture students are forced to take out loans to cover tuition. With design jobs rarely offering large salaries, architects can spend years, if not decades, paying off that debt. Tuition at Harvard’s Graduate School of Design is $40,440 per year. Now, that repayment period could get even longer. On July 1, the interest rate on federally subsidized student loans is set to double, from 3.4 percent to 6.8 percent. The hiked rate will apply to new loans, not existing ones. The increase stems from legislation enacted in 2007, when Congress voted to gradually reduce the 6.8 percent rate to 3.4 percent over a five-year period. At the end of that period, the rate was to jump back to 6.8 percent. The higher rate is expected to generate an additional $6 billion in revenue for the government—a mere 0.16 percent of the proposed $3.8 trillion national budget—but for many future architects, the increase will have a significant impact. According to a recent survey conducted by the American Institute of Architecture Students (AIAS), architecture students can expect to graduate with an average of $40,000 in debt, exceeding the national average by $15,000. Program fees vary widely, both at the undergraduate and graduate level. In a 2008-2009 study, the National Architectural Accrediting Board (NAAB) reported that the average yearly tuition for a B.Arch at public schools was $4,992 in state and $13,624 out of state. Undergraduate tuition at private schools was much higher, averaging $23,561. John LaSalle, an undergraduate student majoring in international development and architecture at Michigan’s Calvin College, says he takes out $2,500 in loans each semester and is two years away from completing his four-year degree. “I’m about maxed out on how much I can take out in subsidized loans,” he says. He plans to pursue a master’s degree, but not right away. “I’m already looking at taking a year or two off after getting my bachelor’s before going on to a master’s to pay down the debt,” he says. He might wait even longer if the increased rate takes effect. Alexander Sexsmith, who in 2005 earned an M.Arch from SCI-Arc (where tuition is about $33,000 per year), currently pays $350 a month toward his student loans. To make matters worse, he was recently laid off due to a slowdown in his office. In Congress, both Republicans and Democrats want to stop the forthcoming increase, but they can’t agree on how to cover the lost revenue. Republicans recently floated a bill called the “Interest Rate Reduction Act” (S.2366), sponsored by Republican Senator Lamar Alexander of Tennessee. This bill proposed pulling money from a preventative health fund established by the new healthcare law. On May 24, the bill was struck down in the Senate, as was a similar bill put forth by the Democrats. Aptly named “Stop the Student Loan Interest Rate Hike Act of 2012” (S.2343), that bill, sponsored by Senator Harry Reid from Nevada, would have made up the lost revenue by altering the way taxes are assessed on wealthier shareholders in S corporations. With both bills now dead in the water, legislators are scrambling to find a palatable alternative before the July 1 deadline. Congressional Republicans sent a proposal to the White House last week with suggestions to offset the $6 billion in lost revenue. The Obama administration is currently reviewing the proposal, which calls for increasing annual employee contributions to retirement programs, compressing the interest-free grace period for student loans, and revising taxes for Medicaid providers. The AIA has not taken a position on the Republicans’ most recent proposal, according to AIA spokesperson John Schneidawind. U.S. student loan debt now exceeds $1 trillion. Former Labor Secretary Robert Reich said during a recent interview with Yahoo that high unemployment and lower pay presents graduating students with “very dim prospects,” in turn making it harder for them to pay off their debts. Laura Mirviss contributed additional reporting for this story. Editor’s Note: This story was updated on June 5, 2012. The original story stated that the AIA lobbied against the S.2343 bill; in fact, it only lobbied against the S corp provision in the bill.